Pops a bottle of champagne, and you just can’t stop giggling. You’re about to get married! 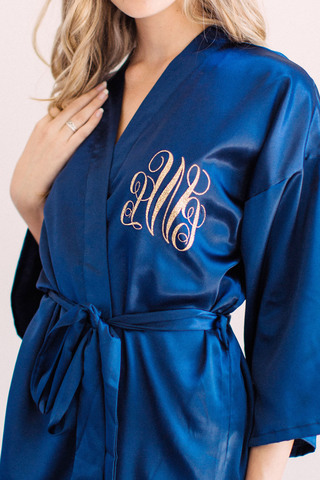 Treat yourself with this lovely silky robe, cheers with your bridesmaids for the beginning of happily ever after. This beautifully made bridal robe will enhance your beauty and be flattering at every angle. This buttery-soft kimono robe is made from high-quality satin fabric, feels so luxurious against your skin! Made from luxury satin fabric, with a soft and silky hand feel. They feature an internal and external tie. Knee length, 36 inches long. All our robes are delicate, please hand wash, lay flat dry, low-temperature iron only. © 2019 Blossom & Syrup. All rights reserved.